In our latest patch, Heroes are called to join forces with the Horde and Alliance in preparation for the battle to control the upcoming Alterac Pass Battleground. This patch also brings Yrel, a new Warrior Hero, into the Nexus, as well as the Echoes of Alterac event, a 50% XP bonus, and much more! Please Note: Shortly after releasing our Echoes of Alterac patch (version 34.0), we also applied a new hotfix (34.1) to resolve issues affecting Ragnaros, Thrall, and the Home Screen. These have been added to the Bug Fixes section below. Catch additional details about the Echoes of Alterac event on the Heroes of the Storm website! An age-old rivalry has flared up as the Horde and Alliance battle for dominance over a strategic pass through the Alterac Mountains. Generals from each faction rally Heroes to their banners in an effort to gain the upper-hand in the struggle to control Alterac Pass. You must decide whether to side with Vanndar Stormpike and the Alliance or Drek’thar and the Horde. Choose wisely! Your decision is permanent, and these battle-hardened Generals will not tolerate traitors among their ranks. Starting the week of June 12, until July 9, those who successfully complete quests for their General of choice will be handsomely rewarded with in-game loot, including a Warcraft Reinforcements Chest, which guarantees a Warcraft Hero of epic or higher rarity. Reconnaissance: Play 4 games as a Warcraft Hero. Reward: Warcraft Reinforcements Loot Chest. Raiding Camp: Achieve 50 Takedowns in winning games. Carry the Banner: Play 6 games with a friend. For the Alliance: Win 8 games as a Warcraft Hero. Scout: Play 4 games as a Warcraft Hero. Strike Back: Achieve 50 Takedowns in winning games. Gaining Drek’thar’s Favor: Play 6 games with a friend. For the Horde: Win 8 games as a Warcraft Hero. Now through July 9, players can earn 50% more XP by playing Heroes of the Storm with friends! Complete Heroes matches in Versus A.I., Quick Match, Unranked Draft, Heroes Brawl, or Team League while partied with a friend to receive a 50% XP bonus. Read our XP Bonus blog for more details. Non-Ranked Modes: During the week of June 19, Alterac Pass will enter Quick Match, Unranked, and Versus A.I. matchmaking queues, as well as Custom Games. Ranked Play: During the week of July 10, Alterac Pass will enter the Ranked Battleground Rotation. Learn even more about Alterac Pass by visiting the Heroes of the Storm website! Alterac Pass is a 3-lane Battleground where Heroes must free imprisoned allied troops, call in their cavalry, and take down the opposing General to claim the Pass for their faction. In addition to enemy forces, the Alterac Mountains are home to many treacherous hazards! Heroes must remain vigilant, as a misstep into a mud pit can prove fatal. Teams would also be wise to recruit the Armored Gnolls and Ice Giants who inhabit the Pass before the enemy faction can harness these deadly creatures for their own gain. Each team’s Core has been replaced by a General who will aid them in fending off attackers. Vanndar Stormpike leads the Alliance (left team) in driving back the Horde forces at Alterac Pass. Drek'Thar has rallied the Horde (right team) to aid in defending the Pass against Alliance invaders. Each General receives bonus Armor and damage based on the number of allied Keeps remaining. Destroy enemy Keeps to weaken their General. When attacking a General directly, be prepared to finish the job! Vanndar and Drek’thar will regenerate Health once they are out of combat. Whirlwind: Deals damage in an area around the General. Charge: The General dashes to the target enemy, dealing damage. Capture Prison Camps to Call in the Cavalry! Three minutes after a match begins, a Prison Camp will spawn for each team. Invade enemy territory, take out the Guards, and free the allied prisoners to call in a Cavalry Charge! Channel an opposing Prison Camp to begin a breakout, and then free the prisoner by preventing the enemy team from regaining control of the Camp for 30 seconds. Watch out for enemy Heroes and Guards! They will attempt to stop any attackers and Channel on their Prison Camp to retake control. Each subsequent breakout will require the capturing team to maintain control for an additional 10 seconds, up to a maximum of 50 seconds. Once a team frees the prisoners at an enemy camp, allied Cavalry will charge down all three lanes, attacking any enemies and Structures in their paths. Cavalry units generate an aura that increases nearby Minion and Hero Movement Speeds, and grants a damage bonus to nearby allied Heroes. The aura’s damage bonus will increase based on the number of Prison Camp events completed so far, up to a maximum of 3 events. Cavalry on both teams will benefit from these increases independent of which team won each Prison Camp event. From 110 – (# of game minutes elapsed * 2) seconds to 150 – (# of game minutes elapsed * 2) seconds. For example: If all Cavalry from the most recent event are defeated at the 10-minute mark, the next set of Prison Camps will spawn at random between 90 and 130 seconds later. Watch out for the Gnolls who inhabit the Pass! They’re formidable creatures who wield a cleaving attack that can shred a Hero’s Armor in no time. The Ice Giants at the northern and southernmost points of the Pass tend to mind their own business, but once provoked, they’ve been known to hurl deadly balls of ice and even stomp the ground in an effort to Slow or Stun their foes. Combatants who don’t mind where they step can fall victim to one of several mud pits that have sprung up within Alterac Pass. Any Hero who enters a mud pit will find their Movement Speed reduced by 16% per second, to a maximum of 60%, for as long as they remain there. Upon finding solid ground, the Hero will regain Movement Speed at 50% per second. Learn even more about Yrel by visiting her Hero page on the Heroes of the Storm website! After traveling to an Alternate Draenor, the forces of Azeroth saved the acolyte Yrel from the Iron Horde. With their aid, she rose to the rank of Exarch and fought back the demonic invasion of her world. Now, she finds herself where time, space, and dimensions converge: the Nexus. Activate to instantly charge Yrel's next Basic Ability at no mana cost. Passive: Yrel's Basic Abilities charge up over 1.5 seconds, increasing in effectiveness, but reducing Yrel's Movement Speed by 25%. Unleash holy energy around Yrel, dealing 38 damage to nearby enemies and healing her for 96. Charging up this Ability increases its damage up to 125 140, and Healing up to 320. Swing Yrel's hammer, dealing 38 damage to enemies in front of her and knocking them away. Charging up this Ability increases its knockback distance, and damage up to 125. Enemies hit at maximum charge are Stunned for 0.75 seconds. Leap to a location, dealing 150 damage to enemies in an area and Slowing them by 50% for 1 second. Charging up this Ability increases its range. Surround Yrel in a barrier for 3 seconds, absorbing all damage taken and Healing her for 50% of the damage received. Yrel sanctifies the ground around her, gaining 40 Armor until she leaves the area. Starting today, troops will now make their Hero selections among the snowy, picturesque peaks of Alterac. Ragnaros: Empower Sulfuras will now miss when Ragnaros is Blinded, and the Ability’s cooldown will be consumed. Bonus damage has been removed and Nukes now deal a flat amount of damage across the entire area of impact. Note: This change was originally made in the Nexomania patch on May 22, but did not make it into that set of patch notes. We apologize for any confusion this caused in the meantime. Developer Comment: The bonus damage dealt by Warheads had very little counterplay in late-game situations. Teams could hoard Warheads and kill any Structure—including the Core—very quickly. Although this center bonus damage presented players with interesting decision points, the mechanic’s problems outweighed its positives. We feel encouraging players to hit as many structures as possible is a similarly fun mechanic that is healthier for the game. Basic Attack damage increased from 140 to 155. Charged up damage increased from 125 to 140. Yrel Heroic Bundle – Available until June 25. Heroes of Warcraft Bundle – Available until July 9. We've once again teamed up with Carbot Animations to add even more HeroStorm-themed portraits and sprays in their signature art style! 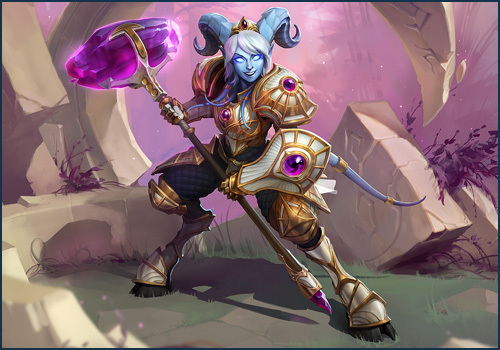 Home Screen: The leftmost tile on Yrel’s Home Screen now correctly opens her Hero page in the Collection. Ragnaros: Lava Wave now correctly dissipates after reaching the end of the targeted lane on Towers of Doom. Thrall: The Feral Resilience Talent now correctly states that it grants 50 Physical Armor, rather than 75. Chromie: A.I. Chromie will no longer cast Temporal Loop on Vehicles, like the Dragon Knight or Garden Terror. Abathur: Ultimate Evolution clones of Lil’ Ragnaros will now use the correct death model when the Ability expires or the clone is destroyed. Gall: The Double Back Talent now displays the base Dread Orb icon art the Talent selection pane. Genji: Genji no longer occasionally uses a default pose after being affected by a Time Stop effect during Dragonblade. Medivh: The Mystic Assault Talent and Arcane Rift’s quest icon now display the base Arcane Rift icon art. Tassadar: The Psi-Infusion Talent now displays the base Psionic Storm icon art in the Talent selection pane. Try Mode: A.I. Heroes will now ignore Mercenary Camps. However, an allied Hero will still engage a Mercenary Camp if the player attacks it while that ally is following them. Volskaya Foundry: Minions can no longer clip through the northern Wall near the Fort in the bottom lane. Deckard: Stay Awhile and Listen’s book model no longer visually persists if the Ability is interrupted by a Taunt effect. Deckard: Casting Horadric Cube while on a conveyor belt no longer causes the Ability’s area of effect to disjoint from its visual effects. Deckard: Casting Scroll of Sealing while on a conveyor belt no longer causes the Ability’s area of effect to disjoint from its visual effects. Deckard: Fixed an issue that could prevent a Healing Potion from being picked up if it was placed between an injured ally and Deckard when Deckard is at full Health. Fenix: Offensive Cadence will no longer stop functioning if Fenix is killed when his next Basic Attack would have triggered the Talent’s bonus damage. Li-Ming: Fixed an issue causing Disintegrate to deal one less damage tick than intended. Ragnaros: When cast on Ragnaros in his normal form, Alarak’s Rite of Rak’shir and Alexstrasza’s Blessing of the Red will not persist after casting Molten Core. However, Ragnaros will regain those marks once Molten Core expires. Abathur: Increased the volume of Xenotech Abathur's voiceover lines during Symbiote. Announcers: A number of Announcers’ countdown lines that play at the start of a match will no longer end earlier than intended. Hero Interactions: Fixed an issue that prevented unique voiceover lines from playing when a clash between two specific Heroes, such as Arthas vs. Uther, resulted in a kill. Leoric: Reduced the volume of Leoric’s Basic Attack sound effects. Tychus: Enemy A.I. Tychus was a little too chatty on the battlefield. He’s been ordered to do less talkin’ and more fightin’. Abathur: Symbiote now correctly creates a crown icon above an allied target’s minimap portrait. Artanis: Damage dealt by the Plasma Burn Talent now displays correctly in Death Recaps. Stukov: Healing done by the Superstrain Talent no longer displays as “Unknown” in Death Recaps. Tychus: The Event Log now correctly displays the yellow Run and Gun icon upon completing the Dash Talent’s quest.